The roadbook was modified, looking an experience close to real road books, using new UI icons made with the three classical columns of rally raid road books. With the target of support this new roadbook was developed an audio system than complete the roadbook info, moreover has incidence in other game situations. You will feel the nice voice of the co-driver detailing the roadbook, talking before and after each stage, when you check in a waypoint, when you hit the car and if he feel that you are lost. In this last case he only inform you the situation, but he isn't able to understand how you should return to the right way. 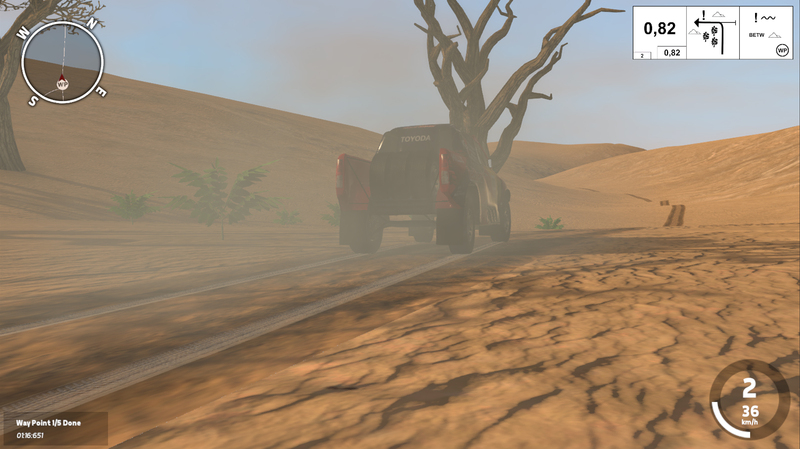 With the roadbook update the environment was modified adding new objects and improving the quality of some of them. The next steps will be improve the 'Hillix' model adding 3D details, upgrading materials and working in suspension's rigging. Third onboard gameplay featuring a lot of news!